This post is sponsored by Blue Buffalo™ and the BlogPaws® Pet Influencer Network™. 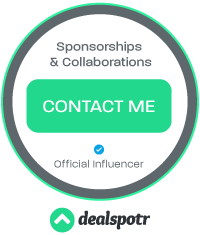 I am being compensated for helping spread the word about Blue Buffalo’s extensive product offering for cats and dogs available at PetSmart®, but Newly Crunchy Mama Of 3 only shares information we feel is relevant to our readers. Blue Buffalo is not responsible for the content of this article. In my home, we are definitely very pet-friendly. With an adorable Yorkie named Trouble, and 6 kitties, all of whom were rescues, you could certainly say we have a full house. Of course we don't complain, since this just means more love to go around. Plus, my kids positively thrive with 4-legged companions to help care for. My 5 year old, Xander, even wants to be a "Pet Doctor" when he grows up. That, or a superhero. It really depends on the day. Maybe he could be a pet-saving hero that battles all of the high-kill shelters worldwide? Anyway, my kiddos love helping to care for our pets. They enjoy giving belly rubs, refilling the water bowls, and even helping choose the best foods and snacks for our canine and feline family. 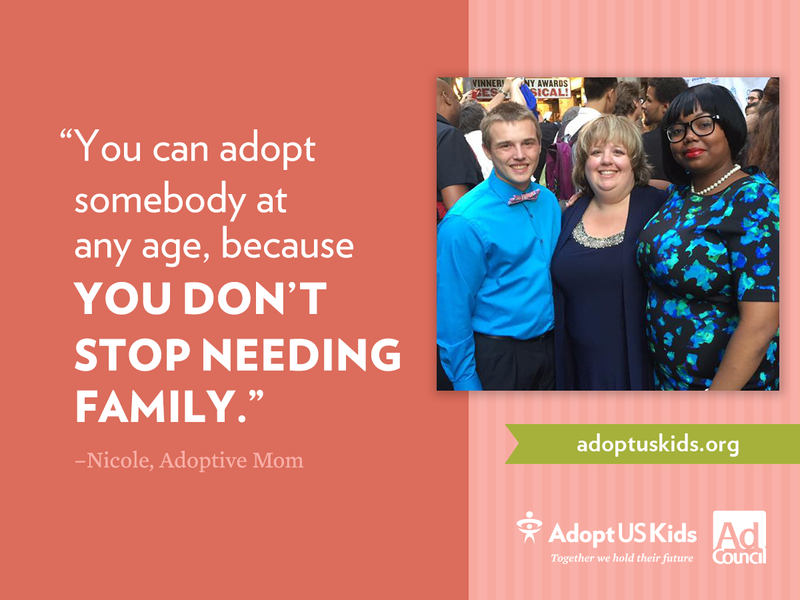 And yes, since they're family, we always want to offer them the best that life has to offer. 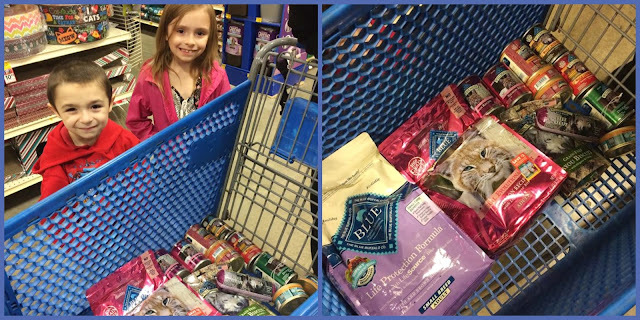 That's why we were so excited to try Blue Buffalo™ foods and treats, available at our local PetSmart store. Blue Buffalo™ offers cats and dogs nutrient rich, grain-free foods and treats that help them thrive. My kids LOVE heading to PetSmart, by the way. Not only do they help choose treats to pamper our pets with, they also get to say hello to all kinds of animals like birds, fish, small mammals, reptiles, and of course, the cats and dogs that are present at local adoption events. 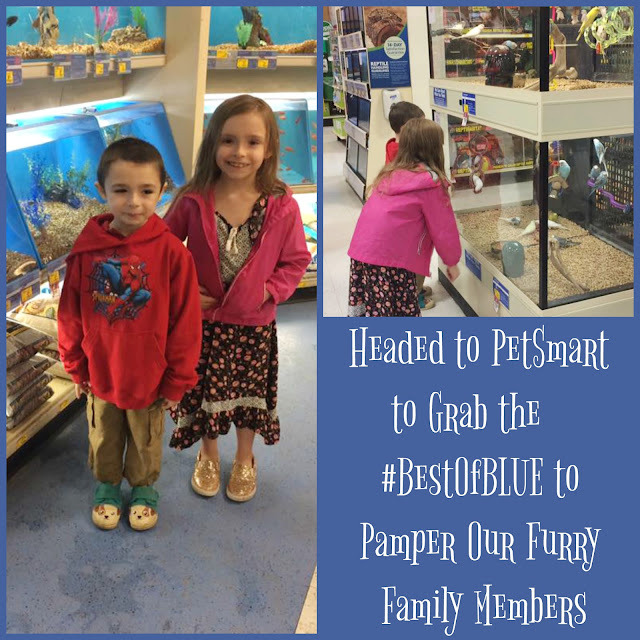 Sophie and Xander were really excited to head to PetSmart in Akron, OH to pick up an assortment of Blue Buffalo products for our pets. Since we're homeschooling, we try and make everything a learning experience. When we arrived at the store, we allowed the kids to lead us, letting them practice their reading skills and locate Blue Buffalo products on the shelves. In almost no time flat, Sophie was able to find the Blue Wilderness Lynx Lair, a very special area that caters to the primal cravings of cats. They also offer a great Wilderness line for dogs! We also discovered BLUE Life Protection Formula. BLUE Life Protection Formula always features real chicken, fish, or lamb. They use whole grains, garden veggies and fruits and LifeSource Bits®, a precise blend of nutrients that have now been enhanced with Super 7 package of antioxidant-rich ingredients. Importantly, BLUE Life Protection Formula contains no chicken (or poultry) by-product meals, no corn, wheat or soy and nothing artificial and is formulated for all breed sizes and life stages. We ended up choosing a fairly wide variety of products for our pets. 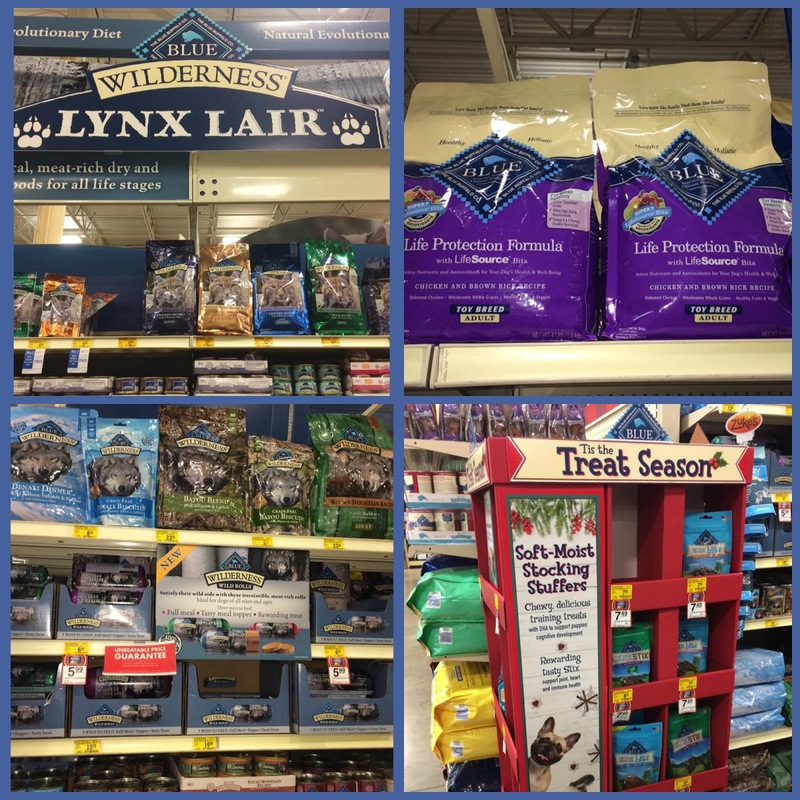 We grabbed a couple bags of hard kibble, including the BLUE Wilderness Natural Evolution Salmon Recipe for Cats and the BLUE Life Protection Formula for Small Breed, Adult Dogs. 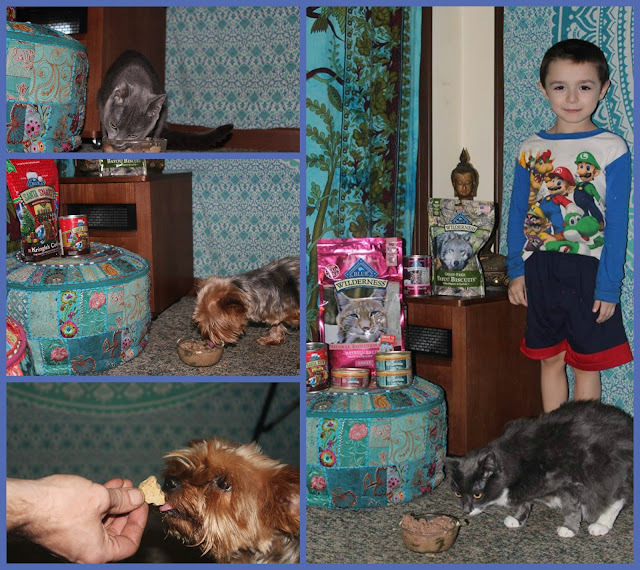 We also decided to try an assortment of wet foods for both cats and dogs, as well as some rather interesting looking treats. How about BLUE Wilderness Bayou Biscuits, which include Alligator and Catfish? Thankfully, Trouble has a taste for the exotic, and loved this flavor! She loves the taste, and I love the fact that these treats are grain and gluten-free, which make them a wonderful source of protein and easy for my pets to digest. Once we got home with our massive BLUE Buffalo haul of deliciousness, we decided to see how our furry family enjoyed everything. It was so hard to decide which flavors to try first. Salmon? One of the tempting Wolf Creek Stew varieties? We let Xander decide, since he's so passionate about animals, and wants nothing more than to make our pets as happy as possible. Until the cats decided to check things out. Trouble got ganged up on by 3 cats, and ran away before finishing her meal. Much to our surprise and amusement, the kitties even LOVED the Santa Stew, and didn't seem to care that this was dog food. Rather than letting them steal Trouble's special meal, we grabbed another dish and filled it for the cats to sample. 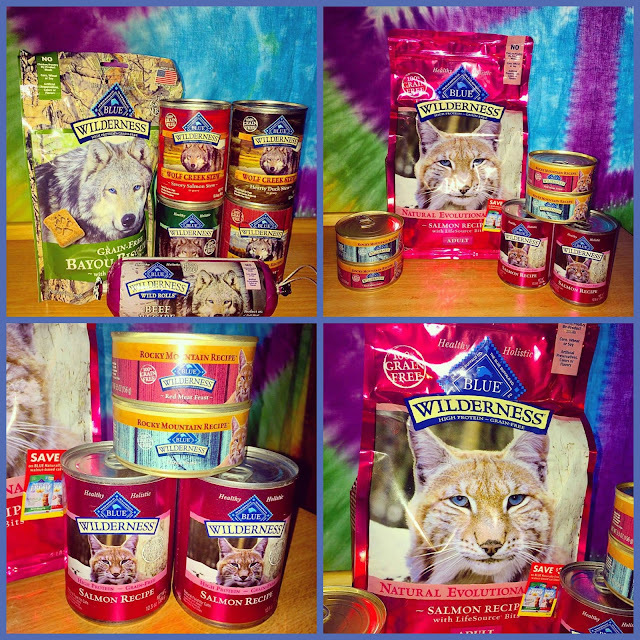 We chose the BLUE Wilderness High Protein, Grain Free Salmon Recipe wet food. What cat can resist Salmon, after all? Needless to say, this was an instant hit with my favorite felines, so I had to open up another can to make sure there was enough to go around. Overall, we are absolutely thrilled that we chose to give BLUE Buffalo a try. Not only are these products made from the highest quality ingredients that speak directly to our pets' natural, primal instincts, they are also grain and gluten-free, making them a natural choice for our pets. 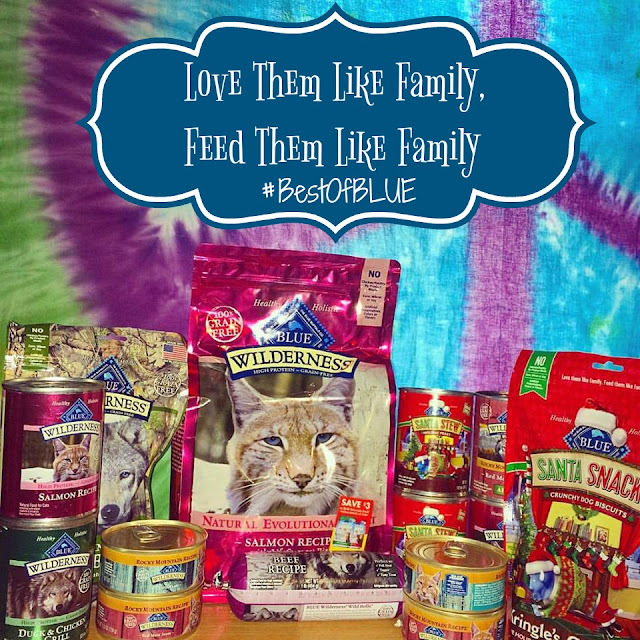 Since we love them like family, we feed them like family with BLUE Buffalo. It doesn't get much better than that, folks! COMING SOON HERE ON THE BLOG : Look for some fun tips on how to include your pets in Holiday celebrations, including these fun, seasonal treats from BLUE Buffalo! “Pete’s Dragon,” a reimagining of Disney’s cherished family film centered on an orphaned boy named Pete and his best friend Elliot -- who just so happens to be a dragon -- comes home on Nov. 29 on Digital HD, Blu-ray™, Disney Movies Anywhere, DVD and On-Demand. And the timing couldn’t be better: Today’s announcement ushers in tomorrow’s World Dragon Day and the heartwarming adventure arrives just in time to entertain the entire family this holiday season. "Pete's Dragon" stars Bryce Dallas Howard ("Jurassic World") as Grace, a forest ranger in the Pacific Northwest who happens upon 10-year-old Pete, played by Oakes Fegley ("This is Where I Leave You"). Oona Laurence ("Southpaw") is Natalie, the 11-year-old daughter of Jack, a lumber-mill owner played by Wes Bentley ("The Hunger Games"). Karl Urban ("Star Trek") is Jack’s bumbling brother Gavin and Oscar®-winner Robert Redford ("Captain America: The Winter Soldier") portrays Mr. Meacham, an old wood carver who delights the local children with tales of a fierce dragon. The film is directed by David Lowery ("Ain't Them Bodies Saints") from a screenplay by Lowery & Toby Halbrooks based on a screenplay by Malcolm Marmorstein and produced by Jim Whitaker, p.g.a. ("The Finest Hours”), with Barrie M. Osborne ("The Lord of the Rings: The Fellowship of the Ring") serving as executive producer. I recently partnered with Kungs, a Finnish producer of premium snow brushes and ice scrapers that are tested in the harshest Arctic conditions— to bring you some fun expert tips from one of the coldest countries on Earth: Finland. 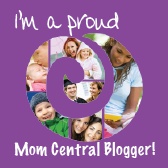 Some may not know this about me, but in addition to being a blogger, a wife, and a mother, I am also an activist. Yes, I attend peaceful protests-NOT riots, I volunteered hundreds of hours between 2 different Presidential campaigns this year, and I am that person who isn't scared to call or write to our elected officials to express my feelings, positive or otherwise. I have many causes I support, from LGBTQ rights, racial, social, and economic equality, and of course, the protection of our planet and the environment. Needless to say, this is a constant, uphill battle, and one I will continue to fight for the future of my children and their children. More than ever now , people just like you and me are seeking ways to spread positivity in our country. One way to do that is to make sure every purchase you make and every gift you give has a positive impact on our planet. prAna offers organic, hemp, sustainable, and fair trade items so that consumers feel great about the things they wear and the items they give. Today, I want to talk about something that's sure to delight any kiddos that love to build and create. The K'NEX 25 Model Ultimate Building Set offers tons of possibilities for building fun! With over 375 K'NEX rods and connectors, there's nothing that your little builder cannot create. All it takes is a little imagination. Of course detailed instructions for 25 pre-designed builds are included as well. Parts can be stored in the convenient treasure chest style package for easy storage. This set is perfect for builders ages 7+. All parts are U.S.A. made. Today, I want to talk about something that's sure to delight any thrill-ride enthusiasts OR budding designers in your life. K'NEX offers a wide assortment of building sets, including the oh-so-awesome Clock Work Roller Coasterbuilding Set!